VANCOUVER, BC / ACCESSWIRE / August 27, 2018 / MGX Minerals Inc. ("MGX" or the "Company") (CSE: XMG / FKT: 1MG / OTCQB: MGXMF) is pleased to announce that joint-venture partner Belmont Resources (BEA) has reported that drilling has reached a depth of 1,798 feet (548 metres) into the playa sediments in hole KB-3, the first hole of the 2018 drilling program at Kibby Basin. The first section of the hole was drilled to a depth of 1,270 feet using a mud rotary method, and the remaining 528 feet was completed with a diamond core tail. A total of 126 samples of drill cuttings from the mud-rotary section of the hole have been collected and shipped to ALS Global lab facility in Reno, Nevada for assaying. Lithium and multi-element assay results from these samples will be compiled once testing is complete. The borehole targeted the southern portion of a large MT conductor, which may represent saturated sediments containing lithium brine. The hole drilled through lacustrine playa sediments - dominantly calcareous clays and silts grading to lithified claystone´s and siltstones at depth. Sand and gravel zones, which may represent brine-bearing aquifers, were encountered at depths of 150-170 feet, 210-230 feet, 260-300 feet, and 900-920 feet, where a potential aquifer in a cobble gravel was intersected. Oxidized clay zones at 400-640 feet and several thinner zones of clay deeper in the hole are being evaluated as potential lithium-bearing bedrock mineralization. Thin intervals of altered rhyolite ash and possible hot-spring sinter were encountered at 1411-1412 feet, 1488-1490 feet and 1589.5-1590 feet. Operation of a paleo-geothermal system is evidenced by the silicified intervals and fronts of pyrite and magnetite alteration increasing below a depth of 1500 feet. A down-hole geophysical survey including gamma-caliper-temperature-fluid resistivity and SP, SPR logging will be conducted on the hole to identify permeable aquifer zones and conductive brine zones. Water samples will be collected after the geophysical logging, and will be assayed for lithium, associated elements and physical properties. Sections of drill core from 1270 to 1798 feet will be split and similarly assayed as above. MGX is partnered with Belmont Resources (BEA) on the Property and currently earning a 50% interest with the goal of forming a 50/50 Joint Venture (the "Joint Venture") to utilize MGX´s rapid lithium extraction technology. Kibby Basin is located in the western portion of the Great Basin in Nevada. The property covers 2,560 acres located in Esmeralda County, Nevada. Kibby Flat is a dry playa and no springs or water sources occur on the Property. 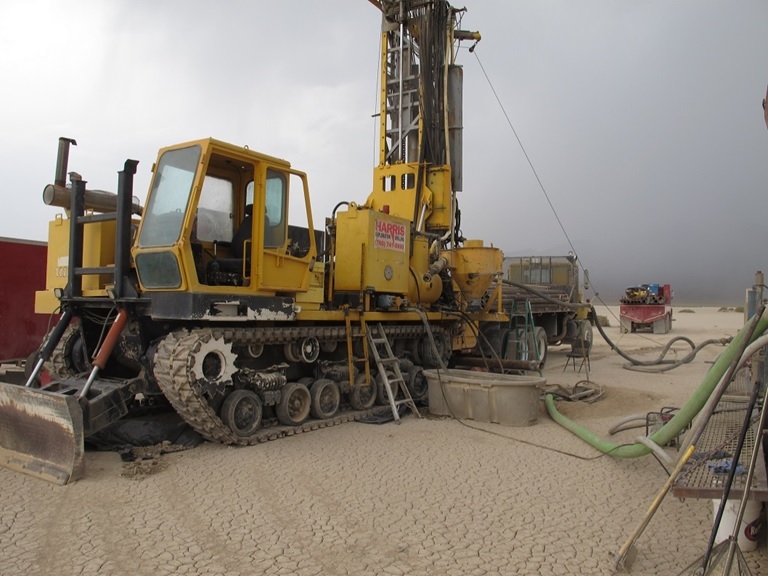 Geothermal research by the Nevada Bureau of Mines and Geology ("NvBMG") identified three wells and springs in the region. All three sources indicated near-surface water. Nevada has abundant geothermal resources and NvBMG compilation has outlined areas with potential heat flow, based on surface temperatures of springs, drill hole-water temperatures, geothermal-related geochemical signatures, and associated geologic settings. These areas suggest zones of potential elevated heat flow. Geologic research of the Kibby Basin has indicated that proximal rhyolitic flows and tuffs surrounding the basin could be a potential source of Li brine in the Kibby Basis Playa. In addition, the Kibby Basin is located within a geothermal cluster at a basin low setting. Regional geophysical signatures in the area reflect similar anomalies comparative to that of Clayton Valley, approximately 50km to the South, location of Abermarle´s Silver Peak Mine, the only North American lithium producer. This press release contains forward-looking information or forward-looking statements (collectively "forward-looking information") within the meaning of applicable securities laws. Forward-looking information is typically identified by words such as: "believe,´´ "expect,´´ "anticipate,´´ "intend,´´ "estimate,´´ "potentially" and similar expressions, or are those, which, by their nature, refer to future events. The Company cautions investors that any forward-looking information provided by the Company is not a guarantee of future results or performance, and that actual results may differ materially from those in forward-looking information as a result of various factors. The reader is referred to the Company´s public filings for a more complete discussion of such risk factors and their potential effects which may be accessed through the Company´s profile on SEDAR at www.sedar.com.